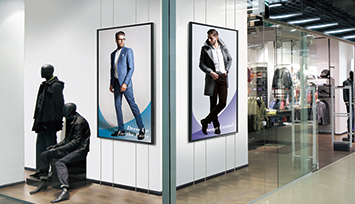 When it comes to digital signage, size and flexibility matter. Sharp’s PN-R706/R606 professional LCD monitors offer 70 or 60 inches of high-impact screen space along with the flexibility to match your installation location. 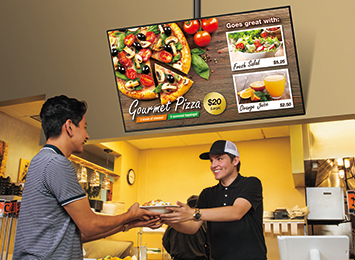 Whether set up at a tilted angle or hung from the ceiling, these eye-catching monitors have the size to convey your message clearly and vividly to your audience. DisplayPort™ 1.2 connectivity comes standard, and the interface can be expanded with an optional wireless board or HDBaseT™ 2.0 receiver board. All this flexibility gives you greater scope to create an appealing space and deliver a compelling message. Thanks to their 1,920 (H) × 1,080 (V)-pixel resolution, the PN-R706/R606 monitors express all of the detail and visual impact of your selected full-HD content. Everything from fine text to intricate graphics is rendered crisply and clearly. 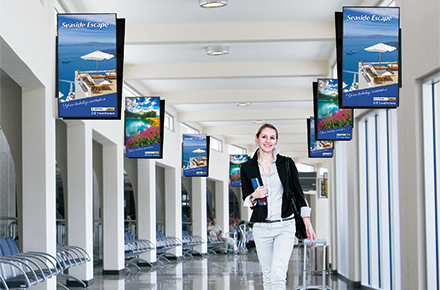 Brightness of 700 cd/m2 further enhances their performance in professional digital signage applications. Whether in a landscape or portrait orientation, the PN-R706/R606 monitors can be installed face up or tilted backward to an angle up to 90 degrees and forward to an angle up to 45 degrees. Such flexibility helps you to incorporate these monitors into a wider-than-ever variety of settings. Note: Please consult with your local authorised Sharp dealer or representative regarding tiltable angles and other installation conditions. Measuring just 8 mm on the top/right/left and 13 mm on the bottom, the PN-R606’s slim bezel helps onscreen content stand out and catch the viewer’s eye. Images fill the screen beautifully, reaching almost to the edges of the monitor. The subtle design of this monitor makes it a stylish fit for virtually any location. The PN-R706/R606 monitors can be suspended by wire from their rear housing, using the bundled mounting brackets. Appearing to float in mid-air, a wire-suspended PN-R706/R606 creates a sophisticated impression that catches the eye. Note: Please consult with your local authorised Sharp dealer or representative for installation advice. The PN-R706/R606’s remote controller offers enhanced operability. For example, the remote controller and monitors can be assigned an identity number (from 0 to 9) for mutual recognition, which enables the remote to send commands to the targeted monitor only. The remote also lets you perform basic operations on connected HDMI-CEC compatible devices, including power on/off. And it has three designated function buttons—HDMI™, DisplayPort, and Option—to simplify input switching. To enhance their functionality in professional signage applications, the PN-R706/R606 monitors come standard-equipped with a range of interface terminals such as HDMI inputs and DisplayPort 1.2 input/output terminals. What’s more, these LCD monitors feature an Intel® Mini OPS-compatible expansion slot that supports the addition of an optional expansion board. You can add either an HDBaseT 2.0-compliant receiver board that supports various types of media and control signals or a wireless board that brings convenient functionality to office environments. An optional board can slide into the slot on the back of the monitor. Installing an optional HDBaseT Receiver Board (PN-ZB03H) allows the monitor to receive HDMI video, audio signals, and control signals sent up to 100 metres via a single LAN cable*1. This brings convenient connectivity with HDMI devices such as PCs and BD players. Compatibility with the HDBaseT 2.0 standard allows you to remotely operate a PC from a USB device connected to the optional board*2. With HDBaseT 2.0 support, you can use fewer cables and reduce the time and cost of installation. *2 Requires an HDBaseT 2.0-compatible transmitter (available commercially). Not all USB devices are supported. The optional Wireless Board (PN-ZB03W) allows up to 10 devices—including Mac® or Windows® computers, smartphones, and tablets—to connect to the PN-R706/R606 simultaneously without any cable hassles. You can display the content of one device on the whole screen, or you can display the content from up to four devices in a 2 x 2 split screen. This wireless collaboration is a great way to enhance productivity in the workplace. Multiple PN-R706/R606 monitors can be set up in a daisy chain configuration, allowing you to display the same content simultaneously on up to 25 monitors. No matter which terminal receives the input signal, it can be output via DisplayPort. 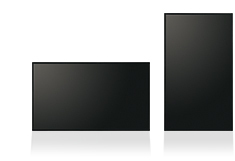 Combining of Daisy Chain and Enlarge functions enables you to display 4K30P content on four (2 x 2) monitors. 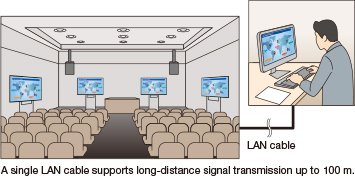 You can send different signals to two daisy-chained monitors and display a separate full-HD 60p video on each monitor. Built-in 10 W + 10 W rear speakers eliminate the need for external speakers and ensure a stylishly streamlined profile. VESA-compliant mounts provide right/left pivot and swivel, ensuring a high level of safety when LCD monitors are mounted on a wall or suspended from a ceiling. Removable handles—two handles on each side for the PN-R706, one on each side for the PN-R606—allow for easy and safe transportation. The PN-R706/R606 monitors are compatible with Crestron Connected software, which means that you can remotely control and manage each monitor via a LAN network. Built solid, the PN-R706/R606 monitors are ideal for use in demanding professional applications that require round-the-clock operation seven days a week. This feature lets you delay the startup of each monitor in a multi-monitor installation. This reduces the load placed on the power supply when multiple monitors are turned on at the same time. Airflow is maintained and heat is dissipated without the use of noisy, dust-creating mechanical air-ventilation fans. The fanless design also facilitates maintenance of the monitor. If the temperature inside a monitor rises, a built-in sensor detects it and the monitor automatically lowers the brightness level of its backlight system. Thanks to an RS-232C interface, multiple PN-R706/R606 monitors* can be easily controlled and monitored from a central location via a PC. Each monitor can be assigned an individual ID code to use when remotely turning that monitor on or off, changing its input, or making various screen adjustments and settings. * These can be connected together in a daisy chain configuration.